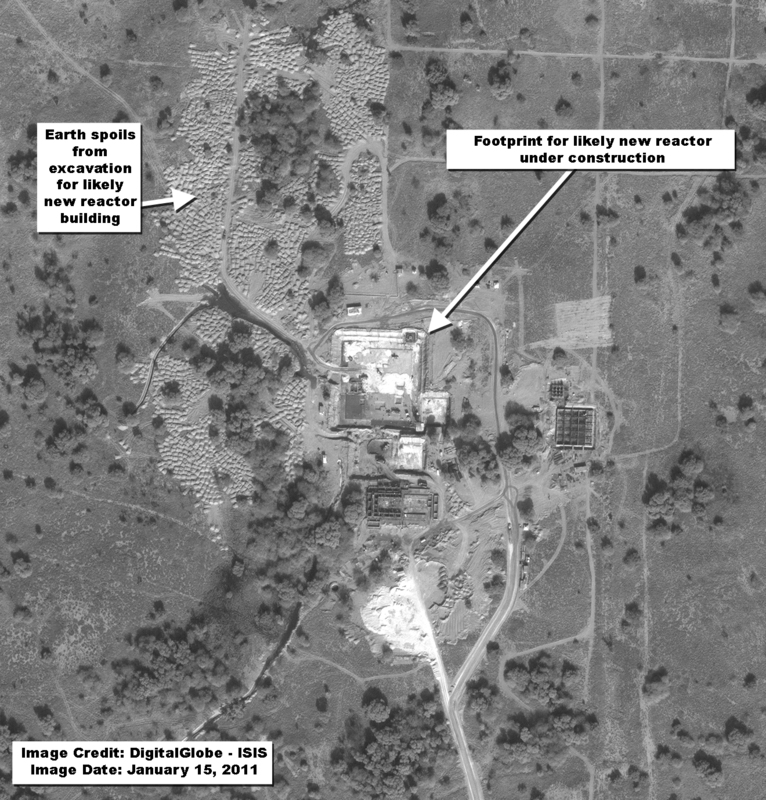 ISIS has obtained DigitalGlobe commercial satellite imagery from January 15, 2011 that shows what appears to be a fourth reactor under construction at Pakistan’s Khushab nuclear site. Pakistan is determined to produce considerably more plutonium for nuclear weapons. The image (see figure 1) shows the building relatively early in its construction, but the footprint for the building is similarly sized to that of the second and third Khushab reactors (see figure 2). The arrangement of other buildings relative to the building footprint is also consistent with the arrangement of buildings next to the third reactor as seen when it was under construction. A new construction staging and storage area can be seen south of the new construction. The new construction is located several hundred meters south of second and third Khushab reactor compound (see figure 3). Pakistan announced the operation of the first reactor at the Khushab site in 1998. Sometime between 2000 and 2002, Pakistan began constructing a second reactor at the site. In 2006, Pakistan began building a third reactor, adjacent to the second Khushab reactor. In commercial satellite imagery from December 2009, vapor could be seen rising from some of the second reactor’s cooling tower fan blades, indicating that the second reactor was at least at some stage of initial operation. Vapor can again be seen rising from some of the second reactor’s cooling towers in the January 15, 2011 imagery (see figure 4), though none can be seen yet over the third reactor’s cooling towers. *An image from September 9, 2010 shows no excavation at the same location. 1 The image does show some initial clearing for what would become the construction staging area, but there were no access roads between this site and the site of the later building excavation (see figure 5). Figure 1. January 15, 2011 commercial satellite image showing the footprint for the likely new reactor under construction at the Khushab site. Figure 2. 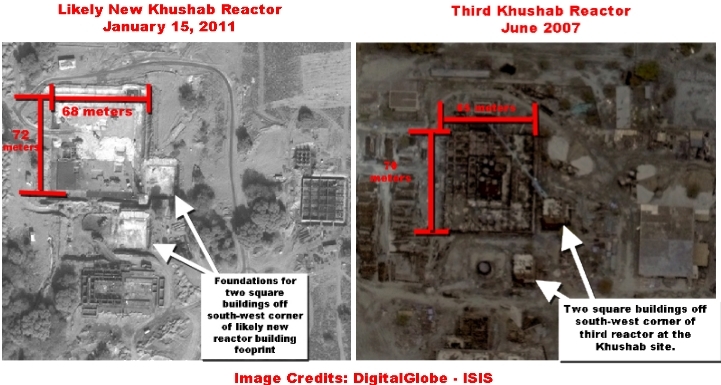 A comparison of the construction footprint of what is likely a new reactor seen in a January 15, 2011 image and the third Khushab reactor while it was under construction in a June of 2007 image. The dimensions of the third reactor building seen in 2007 and the footprint seen in January 2011 are nearly the same. The placement of two square buildings off the south-west corner of each building construction is also very similar. Figure 3. January 15, 2011 wide view of the entire Khushab nuclear site. The likely new reactor construction is several hundred meters south of the second and third Khushab reactor compound. Figure 4. 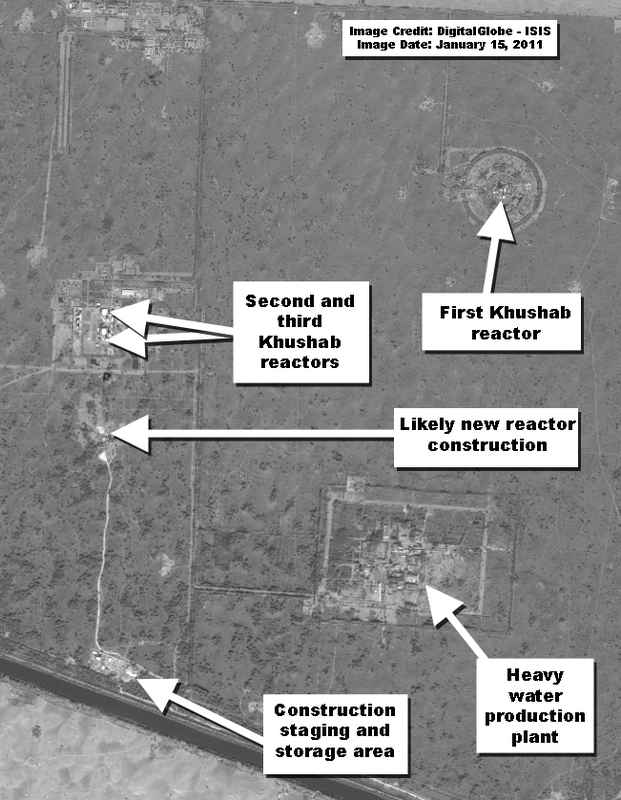 January 15, 2011 close up satellite image of the second and third Khushab reactors. Vapor can be seen above the second Khushab reactor’s cooling towers. 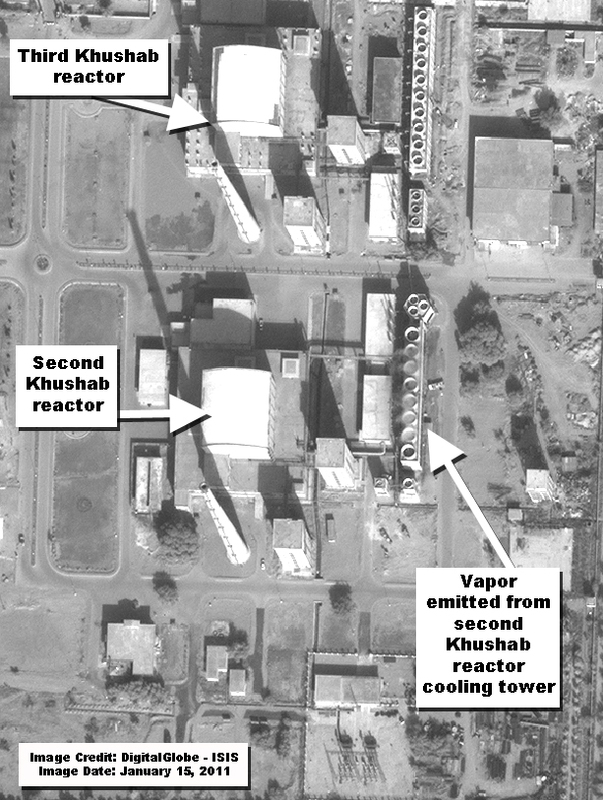 ISIS reported in March 2010 that vapor could be seen coming from the cooling towers of the second Khushab reactor in December 2009 imagery. 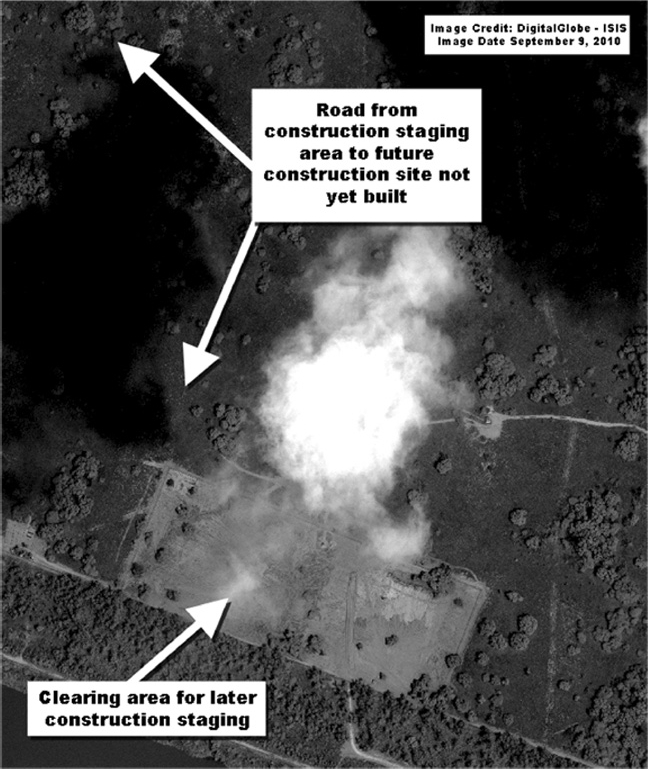 Figure 5, September 9, 2010 DigitalGlobe satellite image shows clearing of an area that would become the construction staging area. A road between this area and the later excavation, as seen in figure 3, is not yet built. 1 In comments to the Washington Post, ISIS misspoke regarding earlier imagery showing no construction. ISIS does not have a November image of this site.